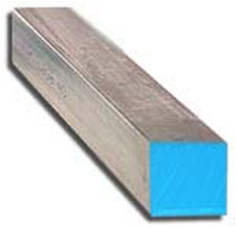 Aluminum Square Bar is produced in several alloys, most generally 6061 is used for structural and engineering applications or when welding is required, forming, bending or corrosion resistance is a concern. 2024 and 7075 are alloys for high strength applications when no welding or very limited forming or bending is required. 6063 is the lowest strength of these alloys, but tends to anodize the best and also has the best finishing qualities. Aluminum Supply stocks 6061T6 but we will special order any alloy in any size and custom cut to size to meet your requirements.